It's not a trailer... it's a Bicycle/RV??? One We Won't See for a While, Now! Bicycle Travel Trailer MUST SEE!!! 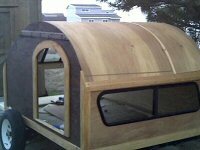 Can you help me decide how to finish my bicycle camper? Bob trailer converted into bicycle teardrop?